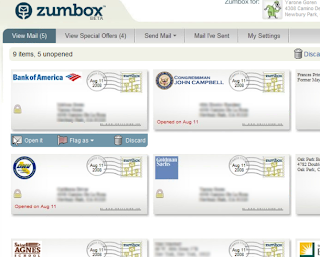 Get A FREE Digital Mailbox + You Could Win $1,000,000 w/ Zumbox! Zumbox is giving away almost $7 million in prizes, including several $1,000,000 prizes! You're automatically entered just for trying out the free Zumbox service. Zumbox is a free service that provides you with a combination digital mailbox and filing system, a Zumbox, based on your street address. They work directly with the mailers that currently send you important mail on paper to deliver exact digital versions of that same mail directly into your Zumbox, where you can view it, set reminders, follow safe links to pay bills, print specific pages and organize an archive of your mail that is available to you forever, for free. Every U.S. street address is already in the system, you just need to activate yours. Zumbox received great reviews on CNET and The Wall Street Journal, as well as several other trusted sources. Now, I don't know about you, but with that many prizes the odds seem pretty good! And you can also double your chances of winning by telling your friends and family about the service. If they win, you win!